None of these photographs have been taken in the zoo or of tamed birds, neither have any artificial perches or bait been put to attract these birds. All shots are taken in wild environment with all caution to minimize disturbance to the birds. Also, I am not a big fan of Photoshoping photographs - as such these photographs are as shot, with minor crop, spot removals, exposure and contrast changes done in Adobe Lightroom. Hope you enjoy this gallery. 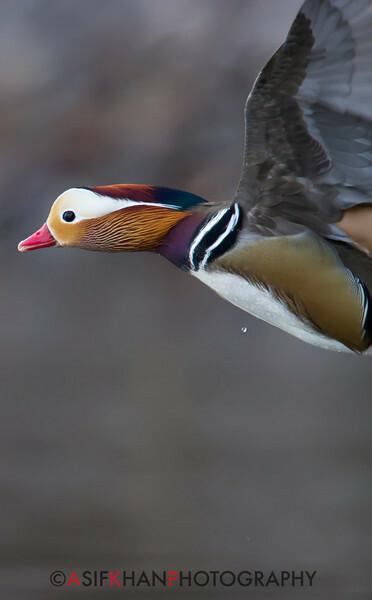 Mandarin Duck (Aix galericulata) [鸳鸯 yuān-yang, 'yuan-yang'] in flight at Yuanyang Lake ( Datangwu Resorvior), Wuyuan, China.